Grain base + protein and veggie filling + dressing or salsa + toppings = one incredibly healthy and delicious lunch! You can use just about any grain for the base — rice, quinoa, millet, or even a “faux” grain like cauliflower rice. Canned beans or lentils and a combination of your favorite raw, steamed, grilled or roasted veggies, will work for the filling and toppings can vary from day-to-day based on what you have in the fridge or pantry — nuts, seeds, chopped fresh herbs, etc. Yesterday’s hummus makes for a great addition to a Mediterranean themed bowl, and that 1/4 jar of marinara that has been hanging out in your fridge is great in bowls with white rice, cannellini beans, marinated artichoke hearts and a sprinkle of basil and pine nuts. Toss lentils with a simple red wine vinaigrette one day and use the rest with a tahini dressing the next. The possibilities are endless! This Mexican Cauliflower Rice Salad is a perfect example of a typical lunch bowl I make. I prepare the cauliflower rice and red onion relish on Sunday evening and keep them in the fridge for the first three lunches during the week. 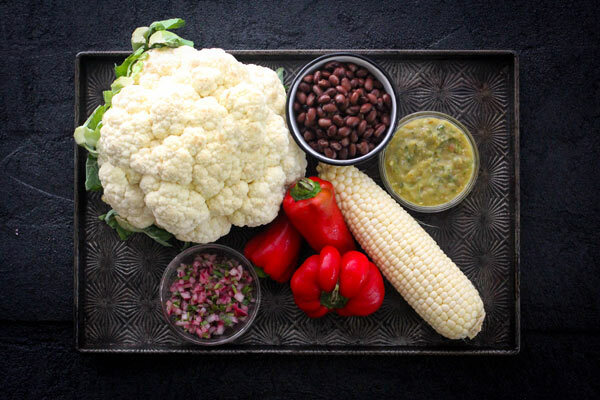 The cauliflower rice takes the place of a grain, on which I layer beans, corn, roasted red peppers and salsa. If you follow the recipe, you’ll have enough ingredients to make 3 servings of this particular salad, or you can prepare the cauliflower rice base and switch things up with different toppings for each serving. This salad is great warm, but it is equally delicious straight out of the fridge for a completely hassle-free lunch. An easy and healthy Tex-Mex inspired lunchbox favorite. This one’s especially perfect to prep on Sunday for no-fuss lunches during the week. In a small bowl, combine the onion, cilantro and lime juice. Set aside to marinate at room temperature for 5-10 minutes, stirring occasionally. Place in an airtight container and refrigerate for up to 3 days. In a large bowl, season the cauliflower rice to taste with kosher salt and pepper, then, if packing ahead for lunches, divide between 3 portable containers with airtight lids. 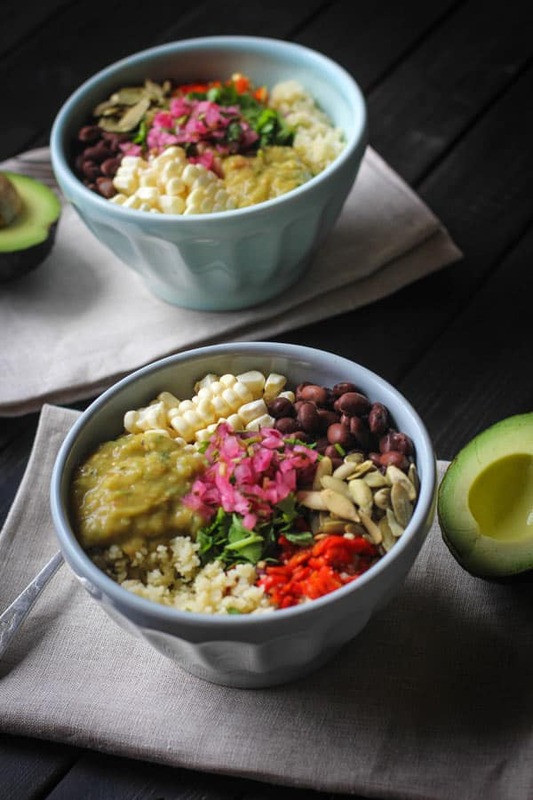 Divide beans, corn kernels, and roasted red peppers among each of the containers, then top each portion with 1/3 of the salsa verde, cilantro, pepitas, and onion relish. Seal and refrigerate for up to 3 days. When packing lunch, include guacamole or a small avocado to eat on the side. If you like the taste of raw cauliflower, you can leave it uncooked. Meg van der Kruik is the blogger, photographer, and recipe developer behind Beard & Bonnet, a gluten-free vegetarian blog that celebrates style, design, food, and family. This looks amazing. I love reading your blog. I always come away inspired to make a salad! Looks amazing! What a colourful and tasty lunch! ooooh this sounds wonderful! I love this kind of meal, and as you mentioned, with salsa on top, it becomes deliciously tasty. I tried that for the first time yesterday, and was shocked. So much so that I think I may have salsa as my dressing more often, especially the pineapple salsa I had from Tjs. Thanks for this, this would be a great recovery meal for me, with chicago closing in, I need to make sure my body is ready! That bowl looks great. I love all of the colors! My boyfriend and I have been wanting to add more cauliflower to out diet. Have you tried it in a crust? I’m wondering how that would taste and I really want to try it. This is my kind of lunch! So delicious! Big bowls of salad like this are some of my favorite meals! I love your formula. It’s pretty similar to what I tend to follow when salad-making as well! The was so good! I am not a huge fan of cauliflower, but it was so tasty and the texture was really good!